The Dallas Police Department’s Office of Community Affairs along with the Central Patrol Division will host an upcoming “Chief on the Beat” Crime Prevention Safety & Health Fair. 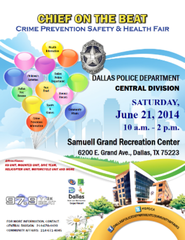 This event will take place at Samuell Grand Recreation Center, 6200 E. Grand Ave., Dallas, TX 75223 on Saturday, June 21, 2014 from 10:00 am to 2:00 pm. “Chief on the Beat” is an opportunity for the Dallas Police Department and residents of Dallas to interact in a family friendly environment. Free health screenings, raffles, entertainment, and food are provided to the public free of charge. Information and activities are available for people of all ages. Former Texas Rangers Jim Norris, Jeff Kunkel, and Ken Suarez will also be in attendance. Don’t miss out on the chance to get autographs and photos with the three! We encourage all residents to come and participate in this fun and informative community event. For additional information, please call the Office of Community Affairs at (214) 671-4045.